A mirror is an important element of the interior that exists in every house, used both for its intended purpose and as an object of decor. Therefore, before you hang the mirror on the wall, you need to carefully consider its location, height. 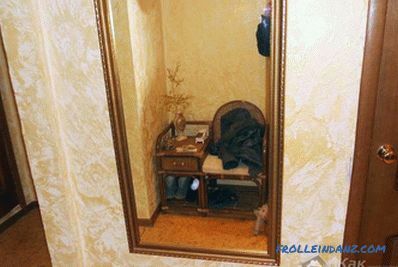 Often there are difficulties in the installation of mirrors on tiles or PVC. 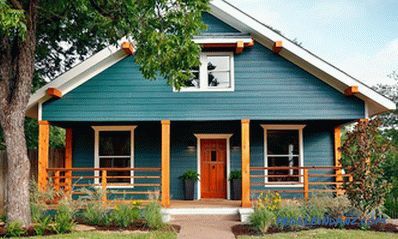 In this article we will consider all the options how to hang a mirror on the wall in different rooms. A large mirror that can completely reflect a person is best hanged in the hallway. The light should not fall on the mirror, but on the object reflected in it. 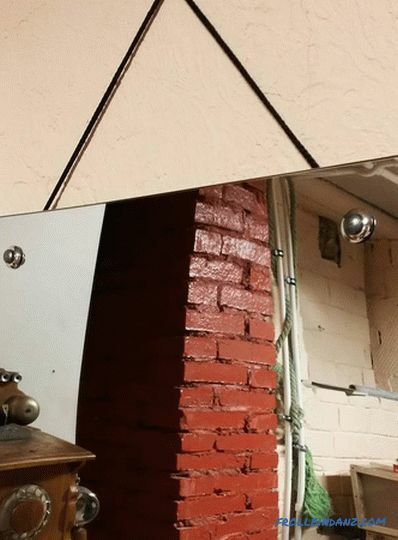 A crooked hanging mirror will distort the reflection. The frame of the mirror is best done in the style of the room where it hangs. A full-wall mirror will give the space a maximum volume. When hanging the mirror, it is necessary to pay attention to the shape of the interior element. They are round, square, rectangular, oval, wave-shaped and others. Installation of the mirror on the surface of brick, drywall, concrete requires the use of a drill, hammer, screws, anchors, dowels. 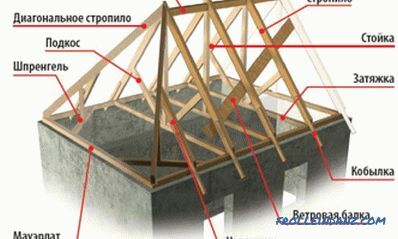 The choice of tools depends on the weight of the mirror, the structure of the base. 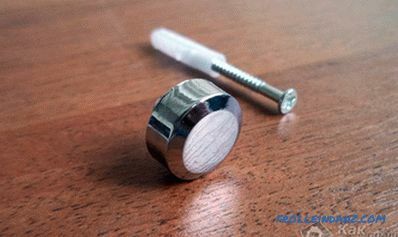 A hole is drilled into the surface of the wall into which the dowel is inserted and the screw is screwed. The ways of fixing mirrors on the walls directly depend on the type of surface on which the interior will be fixed, on its mass, size, and intended functions. The most difficult thing is to hang a mirror on the wall in the bathroom or hallway. It is best to determine the place and prepare it in advance. For example, in the bathroom, it is possible not to lay tiles in the place where the mirrors are mounted. If the tile is already present on the wall, then you should not try to glue the mirror. It is necessary to drill holes in the tile and the base. It is not worth worrying about the fact that the tile will crack if quality materials are used as the basis for manufacturing. the mirror is hung with the help of existing fasteners. Before starting work, it is necessary to prepare tools and fasteners: screws, anchors, hammer, drill, dowels. And yet, whenever possible better to fix the mirror between the facing material. How to do it? The selected place does not need to be tiled. A light mirror on a flat wall can be glued with liquid nails, having treated the joints with a sealant. In the case when the facing material was laid on thick layer of glue, the mirror when mounting greatly deepens. 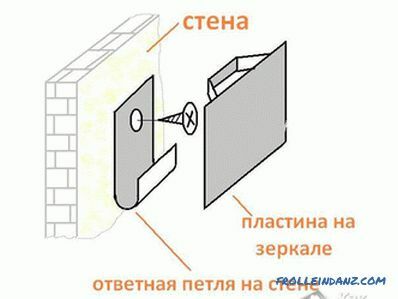 To avoid this effect, you should use a metal profile that is mounted on the wall. 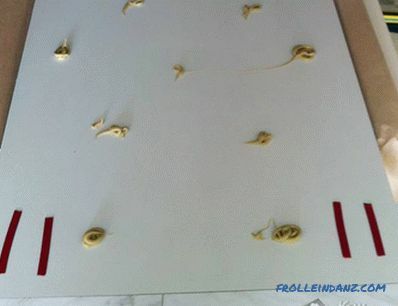 A piece of drywall is attached on top and fixed with liquid nails and fasteners (dowel-butterfly). The mirror is glued to the drywall. If a decision is made to glue the mirror onto the adhesive for the tile, it is worthwhile to make sure that the interior element is covered with a protective layer. This will prevent the reflective surface from darkening when in contact with the cement composition. In order to hang the mirror on the wall, it is not necessary drill holes. 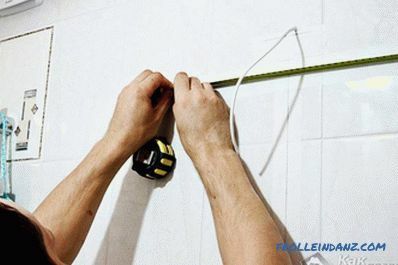 You can simply use double-sided tape and glue, but this is applicable only for mirrors that have a small weight. Glue is distributed around the base perimeter, and the tape is glued in the center. After removing the protective layer from the tape, the mirror should be pressed tightly against the wall surface. It should be remembered that the glue hardens very quickly, so the mirror must be leveled as quickly as possible. Double-sided tape is also called assembly tape. Her main quality is moisture resistance, which allows it to be used in bathrooms.Before starting work with this tape, all surfaces must be thoroughly cleaned and treated with alcohol. Modern mirrors are usually equipped with fasteners that are perfectly combined with decorative interior decoration, and sometimes complement it. Such mirrors are much easier to hang. One of the most frequently asked questions to specialists is how to attach a mirror to a wall if it does not have fasteners. For this purpose, you can purchase a special fastener, through which the mirror is fixed to the bottom and sides. It is more difficult when it is necessary to drill holes in the mirror itself, which is a fragile and capricious thing. 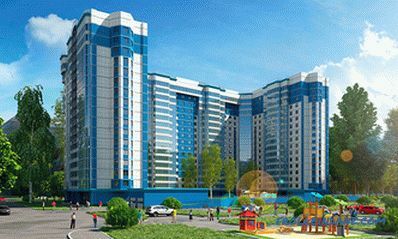 The best solution would be to appeal to glaziers who have experience with such material. But, if you try, you can drill holes in the mirror yourself. And fasteners are sold in any hardware store. 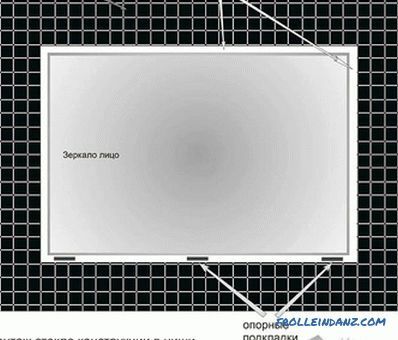 С using diamond drills, you need to drill holes in the mirror. The product needs to be cooled slightly during the drilling process, otherwise it may crack. A “plasticine bath” filled with water and fixed in place of the intended opening is a good cooling option at home. 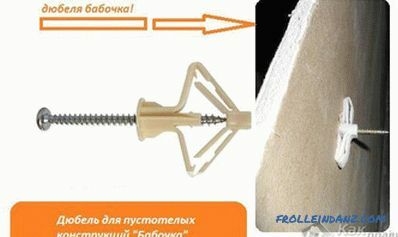 Drilling is done with great care, it is necessary to control the amount of fluid in the bath, add it as it decreases. In some cases, experts recommend to suspend the process and drip turpentine to the place of drilling. Finished holes are carefully cleaned and rounded with sandpaper. After the hole is fully prepared, fasteners are screwed to it and a decorative cap is installed. The mirror can be hung on the wall. In order to hang the mirror on the surface of the drywall, you must purchase such hardware as a dowel, with longitudinal ribs, securely fixing the object. 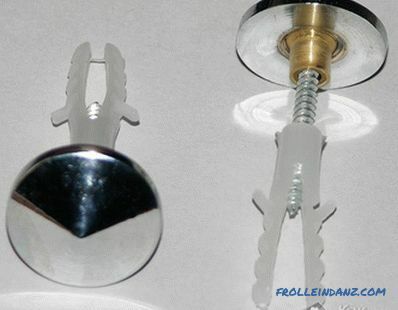 These fasteners have a locking side that does not give the hardware to fall into the drilled hole. With the help of dowel butterflies, you can mount mirrors up to 25 kg. If the mirror weighs more than 25 kg, then you will have to strengthen the plasterboard wall itself from the inside or outside. Most often used for this plywood sheets. Then everything is done according to the above algorithm. In the place where it is planned to hang the mirror, you need to make a sheathing with additional details, on which the interior will be mounted with the help of fasteners. The light mirror can be glued to the panel using double-sided tape or liquid nails. You can drill a hole to the wall if there is a small space between the base and the panels. Often used special suspension for mirrors, which are also an original element of decor for placing in an urban style or techno. Pendants, or brackets, are divided into side and straight, they are chrome, transparent and wooden. It should be noted the bottom line where the brackets will be attached. The mirror is inserted into the slots. The design is fixed and fixed at the top. 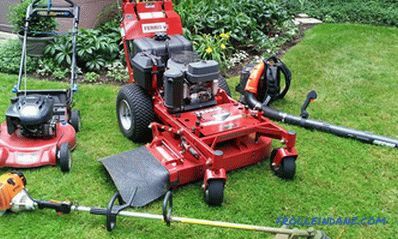 The mirror is tightly clamped in brackets that are attached to the surface of the base. There are many options for mounting mirrors on aluminum profiles, fishing line, chrome fasteners, as well as ways to hang a mirror in the apartment. Almost all of them are available to an inexperienced person. 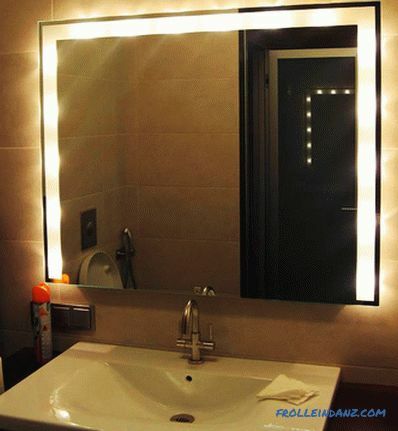 In a dimly lit room, do not install mirrors. If direct sunlight hits the mirror, it will quickly fade and lose its reflective properties. In the bathroom it is better to hang a mirror made of moisture-proof material. And do not install it close to the surface of the wall. Mirrors, hung in small but well-lit rooms, visually increase the space. If the apartment owner wants to visually increase the height of the room or its length, he should hang an oval mirror on the wall.